Every summer, I look forward to peaches being in season. Peaches are great as a dessert, in a smoothie or by themselves. Since we only get to enjoy peaches one season a year in California, I try to eat as many as I can every summer. One of my favorite desserts each summer is my Mom’s peach cobbler. 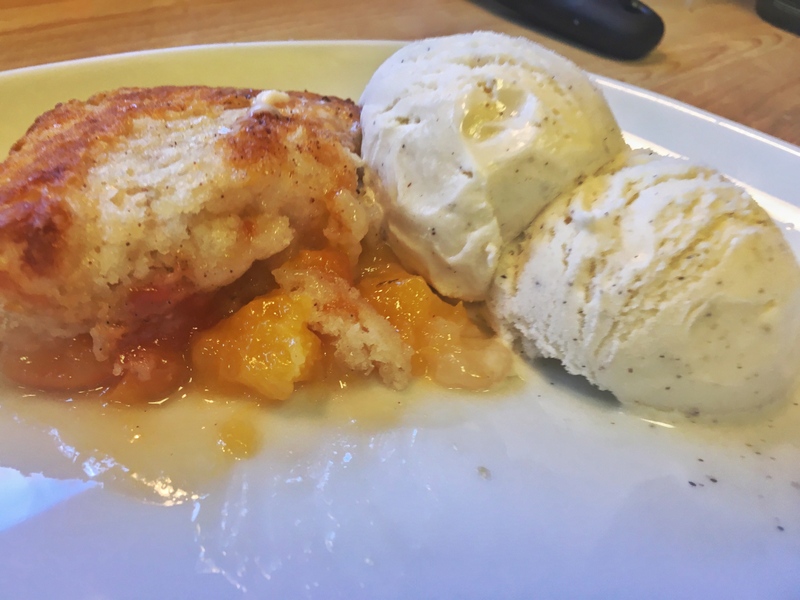 With my mother living hundreds of miles away, I haven’t gotten too many slices of peach cobbler in the last few summers. So, I decided to take matters into my own hands and make my own peach cobbler. 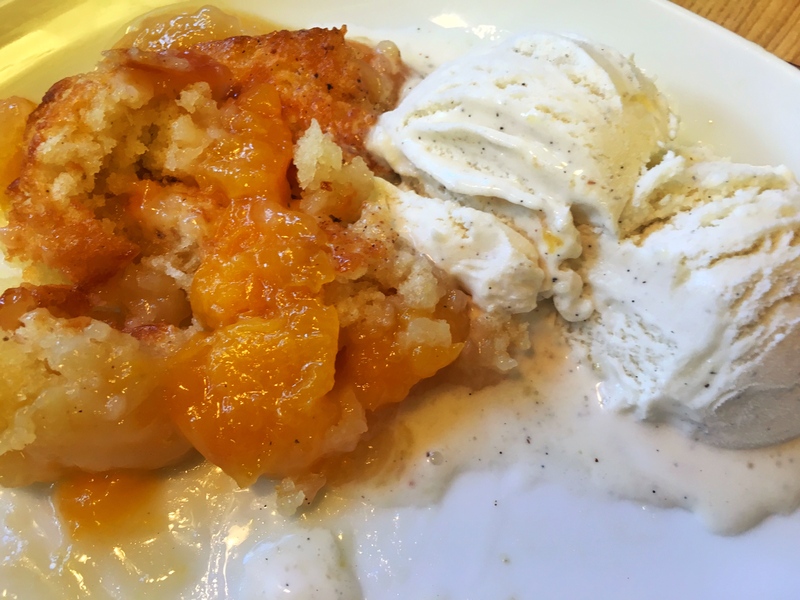 This peach cobbler recipe was good to let the kids assist with, since my kids ate all the extra peaches. It was a great way to sneak in their fruit servings for the day without them noticing. My children mixed the batter, and I did the work of cooking the peaches. I found the how to make a peach cobbler on My Recipes by Southern Living. I love it already, because the instructions are quite simple. 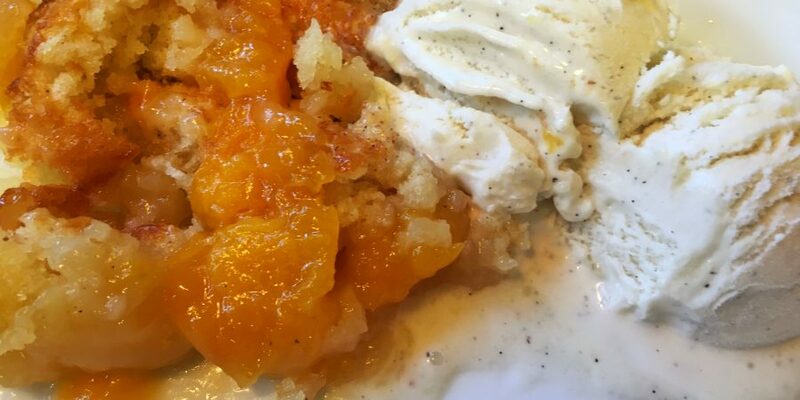 This peach cobbler recipe doesn’t require all the extra work of making and rolling dough. Making the peach cobbler requires just two tasks. Part one is cooking the peaches and part two is making a flour batter. After that, you simply put the batter in the pan and put the cooked peaches on top. After about 25 minutes in the oven, you have a delicious peach cobbler. I made a few adjustments to this recipe. 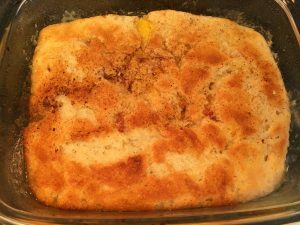 I added cinnamon and nutmeg to the batter and on top of the peach cobbler before putting it in the oven, to give it more traditional flavor. Also, I tweaked the serving size. My family can’t eat a 9×13 inch pan of peach cobbler, so I sized the recipe down to feed about 6 people. If you want to make it in a 9×13 pan, just double the ingredients and bake it for about 4o minutes. What is one of your favorite summer desserts? 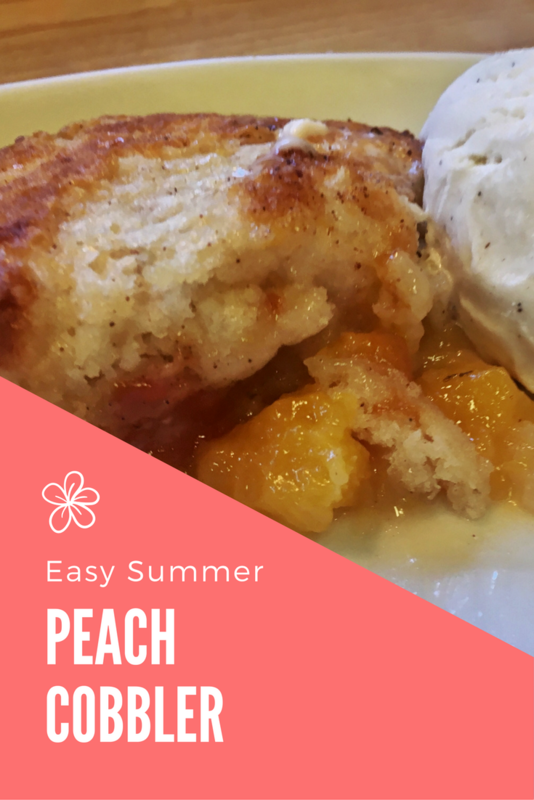 Do you have a dessert that you make with peaches every summer? 2.Melt butter in a Pyrex 8 inch glass baking dish. 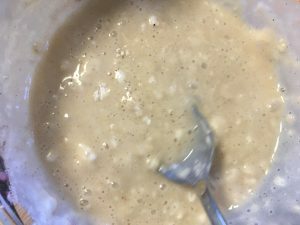 3.Combine flour, 1/2 cup sugar, baking powder, a dash of cinnamon, dash of nutmeg, and salt; add milk, stirring just until dry ingredients are moistened. 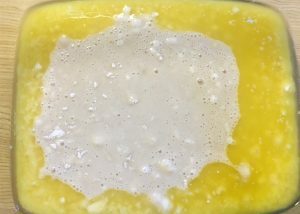 Pour batter over butter (do not stir). 4. 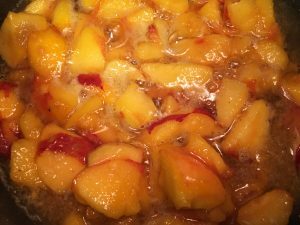 Using your peeler, peel peaches. Add them to a small sauce pan with 1/2 cup sugar and lemon juice and simmer them until bubbly. 5. 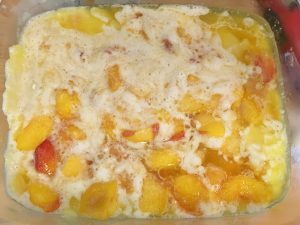 Pour peaches over batter in pan. Lightly top with nutmeg and cinnamon. 6. Bake for about 25-30 minutes, until brown on top. I absolutely love peaches! 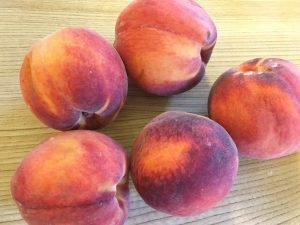 I went peach picking with my kids this spring and I’m pretty sure my two-year-old left there weighing a few pounds more thanks to the amount she ate while picking! 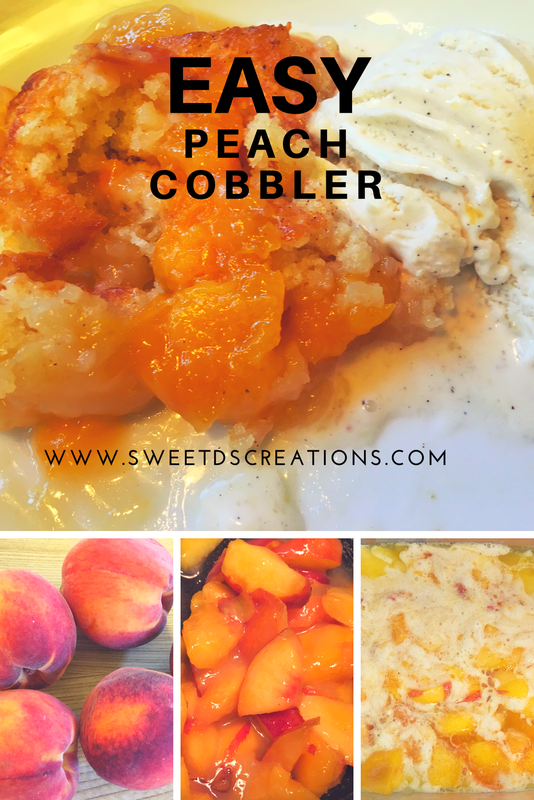 The cobbler looks delicious and hopefully it satisfied your craving for your mom’s peach cobbler! This looks delicious! We made an Apple Crisp last night. I’m looking forward to trying your recipe! that looks so yummy. Thanks for sharing. Oh my goodness, the timing is perfect! I just got a lug/case of peaches! I freeze most of them for smoothies. 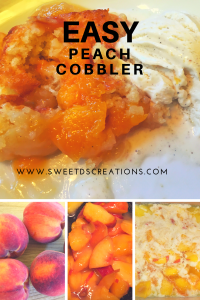 But I LOVE peach cobbler! I will try your recipe. I will add the extra cinnamon and netmeg! P.S. I love your logo! Oooohhhh I can’t wait to make this! I absolutely love peaches! Thanks for sharing! Oh this reminds me of my grandmother’s recipe! I need to make this in the near future while there’s good peaches to be found! I love peach cobbler and it’s one of the first recipes I taught my daughter. We call it the, ‘A cuppa’ recipe, because we use a (1) cup of milk, flour, sugar, peaches and then add the nutmeg, cinnamon. We put half a stick of butter in the pan to melt in the stove while we’re stirring up our dish. Next Post Is Children’s Fairyland the Happiest Place on Earth?